In stock -This product will ship today if ordered within the next 9 hours and 22 minutes. 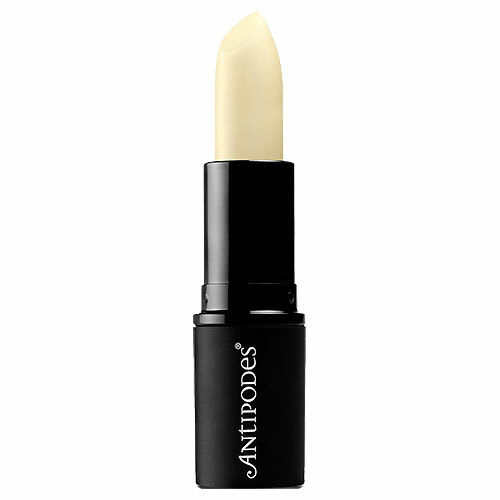 Nourish your lips with Antipodes Kiwi Seed Oil Lip Conditioner! Featuring the bioactive botanical ingredient kiwi seed oil, this healthy and hydrating formula helps keep the skin of your lips soft and supple. Caprylic/capric triglyceride, Prunus amygdalus dulcis (sweet almond) oil, Cera alba (beeswax) extract, Persea gratissima (avocado) oil, Butyrospermum parkii (shea) butter, Theobroma cacoa (cocoa) seed butter, Cocos nucifera (coconut) oil, Actinidia chenensis (kiwi) seed oil, Copernicia cerifera (carnauba) wax, Candelilla cera (candelilla) wax, Simmondsia chinensis (jojoba) oil, Olea europea (olive) oil, tocopherol acetate (Vitamin E), essential oil fragrance of kiwifruit: citral+, citronellol+, farnesol+, geraniol+, isoeugenol+, d-limonene+, linalool+. + Component of essential oil. Below are reviews of Antipodes Kiwi Seed Oil Lip Conditioner - 4g by bodykind customers. If you have tried this product we'd love to hear what you think so please leave a review.